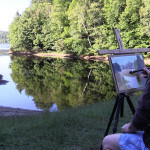 Silver Lake sits high above Lake Dunmore in the Moosalamoo National Recreation Area. This was only my second visit to Silver Lake, the first being 30 years ago. Back then we were young and ambitious. It’s a 45 minute hike uphill and we carried in a boat to fish. The next time you are in Manchester Vermont, I hope you’ll stop by Epoch Gallery. I’m proud to be a member of this cooperative gallery featuring the work of 18 outstanding Vermont artisans. If you’ve never been you’re in for a real treat. 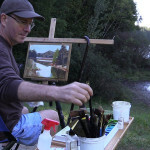 As a bonus, you’ll always find a friendly member artist working when you visit. 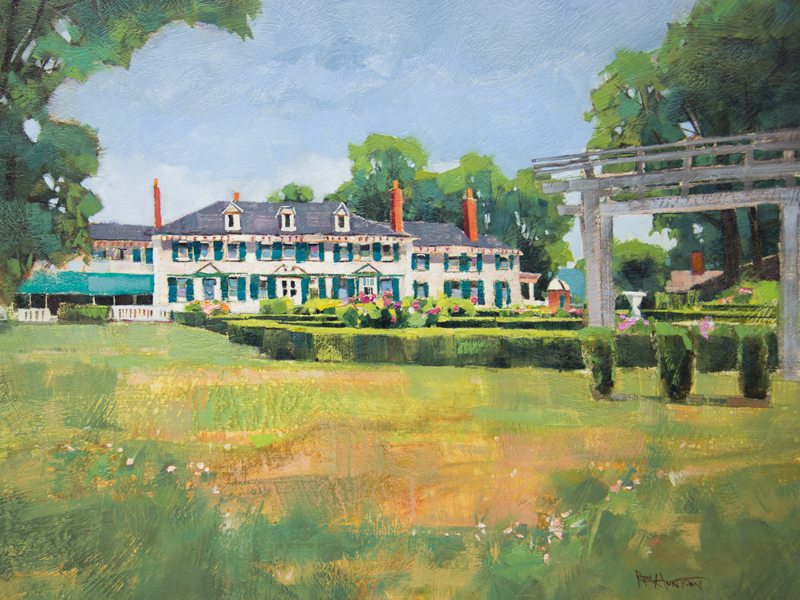 I just hung this brand new oil painting there yesterday…”Hildene”, the summer home of Robert Todd Lincoln. Peter, When I first saw the painting on my computer screen I felt like I could touch the screen and my fingers would be wet ! As always you have captured the beauty of the state we call home. Thanks so much Chris! It was a glorious morning up there and there’s nothing like a painting to capture the feeling and moment. I have been in that gallery many times…but not lately…I will have to stop in and see your painting !!! GREAT place !!! Thank you Dhyan, there is always a changing display of exceptional work by talented artists at Epoch. I enjoy working there two days each month surrounded by good work. Keeps my bar high. Peter: Altho I live a few yards from Fern Lake I have only been up to Silver Lake once (25 years ago). Glad to see the painting, it’s a long hike from the parking lot, as you well know. Thanks Shelagh, I have to admit, my much younger video crew (Daniel and Anne Appelt) helped root me on when I started getting grouchy half way there. My father, brothers, brothers-in-law, and nephews try to make a trip in every year to fish. They have been doing this for years. Such a beautiful place! It is indeed Mag. Your family must catch good fish to make it an annual event. Next time I go I’ll try to bring my pole. Thanks! Pretty. I can just picture myself sitting there, dangling my feet in the water, watching the world go by. I’m afraid the Hildene painting did not last long…sold today. Thanks for all the support Mary Beth! I read your article in Vermont magazine., congratulations. I was born and raised in Vermont and visit every year for the past 29 years. I live in Colorado now and although I love Colorado, Vermont has my roots. Vermont is a special place I call home. 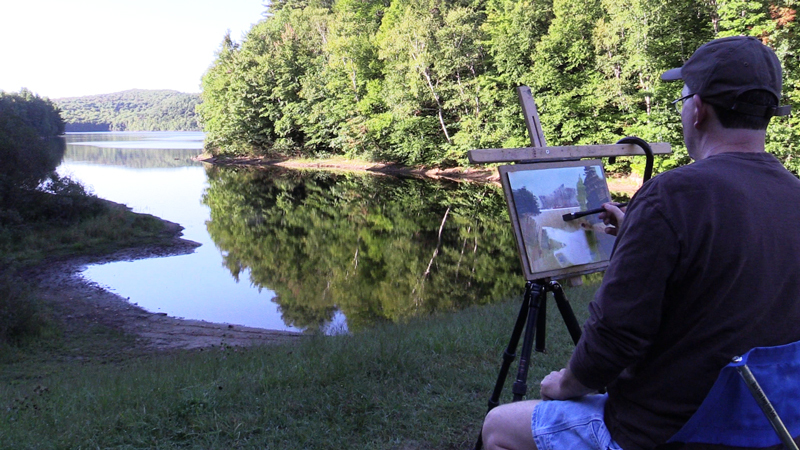 Your beautiful paintings will give me a piece of Vermont. Thank you. Hi Remi, glad you found A Day in Vermont to keep you company way out in Colorado. I lived there (Alamosa) for a couple of years in college. If I HAD to move somewhere other than VT, Co would be on the short list. Thanks! I absolutely love y our Hildene painting. On my trip to New England a few years ago, I was just driving randomly & stopping at whatever place met my fancy when Hildene popped up seemingly out of nowhere. It’s an amazing place (especially the enormous organ which was playing during my visit. And, the view of the mountain from the rear of the home was just breathtaking. I can imagine how peaceful it would be to wake up to that view every morning, no matter what season…You have captured the essence of Hildene! Thanks very much Susan, and I agree…Hildene is amazing! Silver Lake has been part of me for most of my 70 year life. Just this year, I’ve walked that road you did 13 times; trying to stay young!! In 2000 I completed and published a book: Leicester, Vermont’s Silver Lake: Beyond the Myths. It tells the engaging history of the lake. Congratulations for keeping the Silver Lake experience alive through your painting. 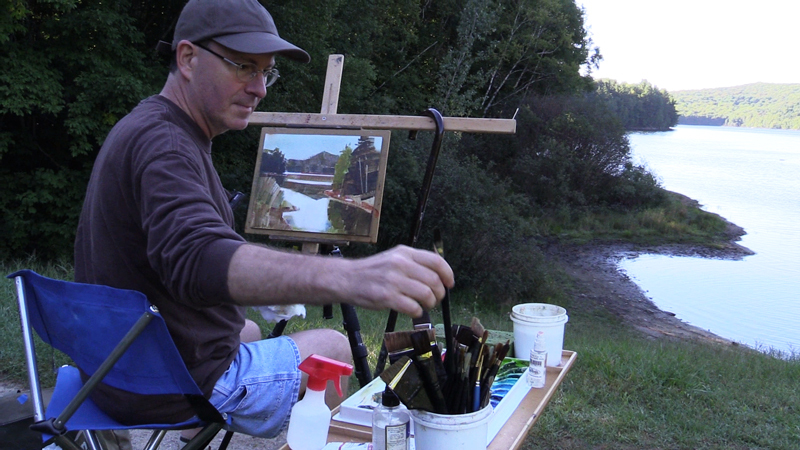 Thanks very much for sharing Bill, it sure would have been fun to have you along on our hike and painting adventure! 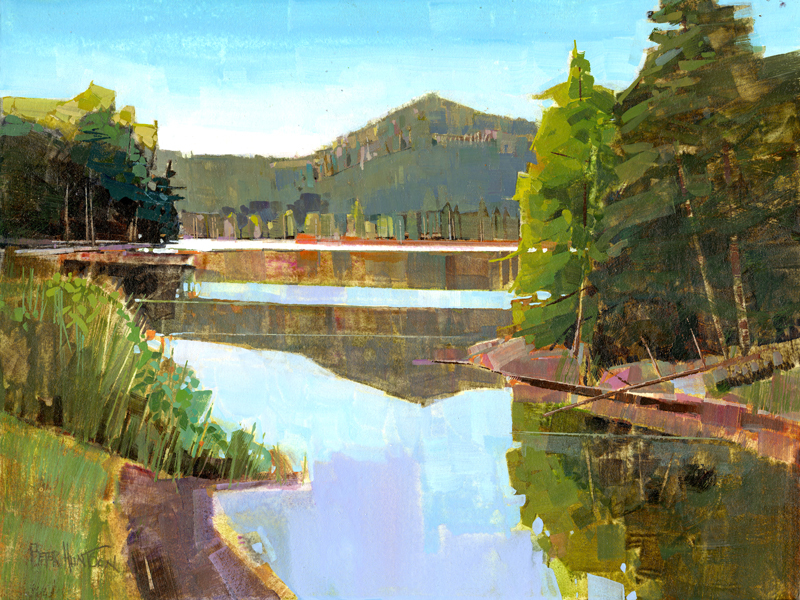 I met you on the trail when you were coming down from Silver Lake with this painting. You game me your card so I had to check it out. Very nice. I love Silver Lake and ordered the print. Thanks so much Linda, I’m shipping your print right now on my way out to paint…not sure where today but it’s gorgeous out. Thanks again and great meeting you!